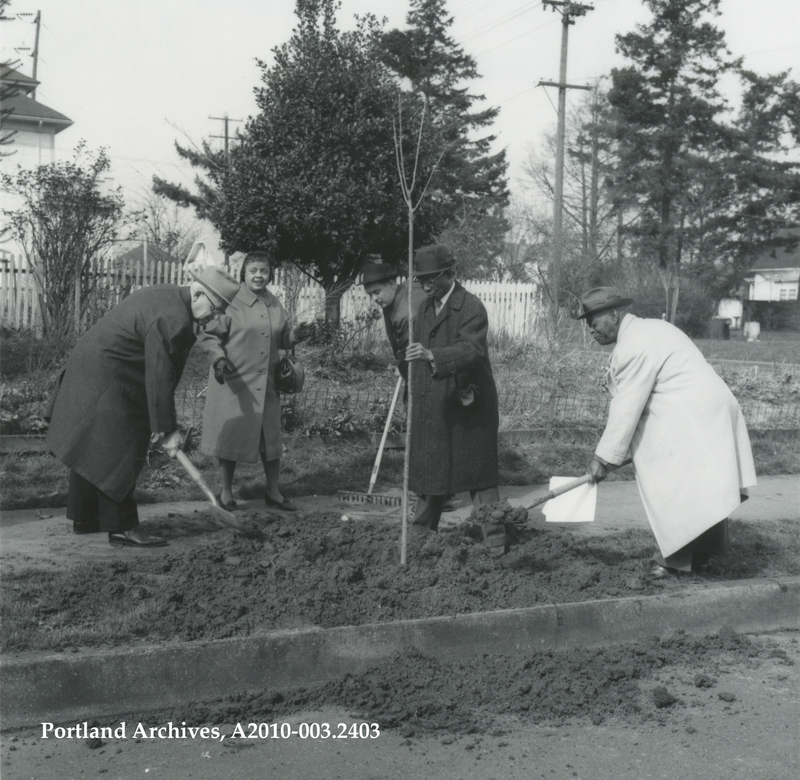 Tree planting for the Albina Neighborhood Improvement Project, 1964. Pictured here from left to right are E. H. Thiel, Lula Crane, Mell Stead, Reverend Roosevelt Rogers, and Herbert Lewis. City of Portland (OR) Archives, A2010-003.2403. Wow! Those wonderful people must have felt so proud! That’s a bold move to wear a white coat around all that dirt! Was E.H. Thiel the Henry Thiel? All or most of the individuals shown in this photo were co-chairs of the Albina Neighborhood Improvement Committee. The date of the photo was 19 March 1964. A shot of the same event and location ran in the Oregonian on 20 March 1964 (p. 26) along with an article about other projects of this committee. 1. Is the tree still there, 2. How many trees were planted during the Albina Neighborhood Improvement project and is it still on going.